Yale climate change survey: After cold winter, public opinion on global warming changes. 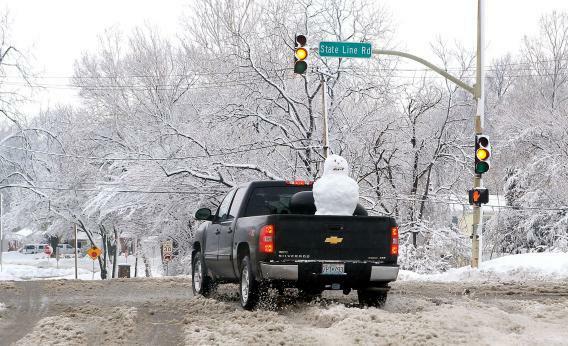 A pickup truck with a snowman in the back drives through the snow on Feb. 26 in Kansas City, Missouri. March was pretty cold this year, and you know what that means: Global warming is a hoax! OK, that isn’t actually what it means. But for a depressingly significant number of Americans, the nippy weather was apparently reason enough to decide that climate change isn’t a real thing after all. Yale’s latest survey of public opinion on climate change found that the percentage of Americans who believe global warming is happening has dropped to 63 percent from 70 percent just last fall. This is the unfortunate corollary to the post I wrote last July, when tornados and scorching temperatures were driving belief in climate change to the highest levels since 2008. Some of it is just seasonal variation: Unscientific as it may be, people are more likely to worry about climate change when it’s warm outside than when there’s a chill in the air. But the 63 percent figure is also lower than the proportion of Americans who believed in climate change at the same time a year ago, at the conclusion of an unusually mild winter. That 3 percent difference is right at the survey’s margin of error, but it may suggest that an unusually snowy March has changed at least some people’s minds about the underlying phenomena. This is all very frustrating for those of us whose belief that the climate is changing is based largely on the overwhelming consensus of scientists who spend their lives studying exactly that. But I’d submit that we should stop worrying so much about the minority of Americans who don’t believe global warming is happening. After all, most of us aren’t really qualified to make that judgment on our own, especially since the trend is so gradual as to be impossible to observe on a day-to-day or even year-to-year basis. Instead, we should worry more about the stunning 58-percent majority who don’t agree that “most scientists think global warming is happening.” That is demonstrably false, and testifies to a fundamental failure of communication on the part of the media coupled with widespread scientific illiteracy among the public. On the other hand, it’s a great triumph for the ideological hacks who run the Wall Street Journal’s op-ed page.